Here is a little description of the first brush I came out with. 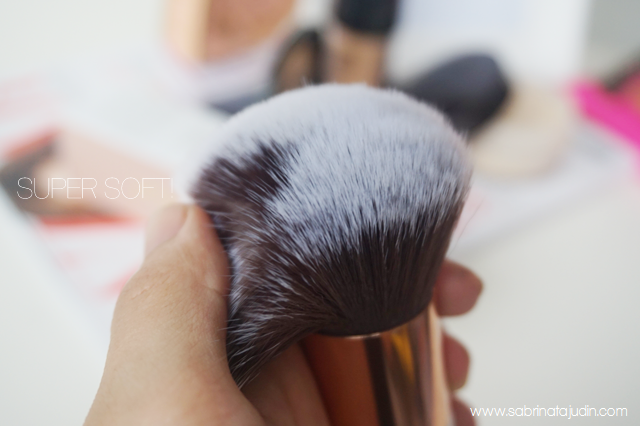 It is the best brush for powder & airbrush application. No more cakey face! Face Luxe Brush is a multi tasking brush that works great with both powders & liquid formula products. It creates a soft focus airbrush finish to your skin. Best used in buffing & padding motion. It features soft dome sculpted shape & ultra soft (non animal hair) synthetic bristles for an effortless, seamless & natural effect makeup application. Work best with, Face Powder, Powder Foundation, Loose Powder, Mineral powder, Translucent Powder, Pressed Powder, Liquid Foundation, Bronzer and many more by your own preference. The handle is made out of wood and painted in white. 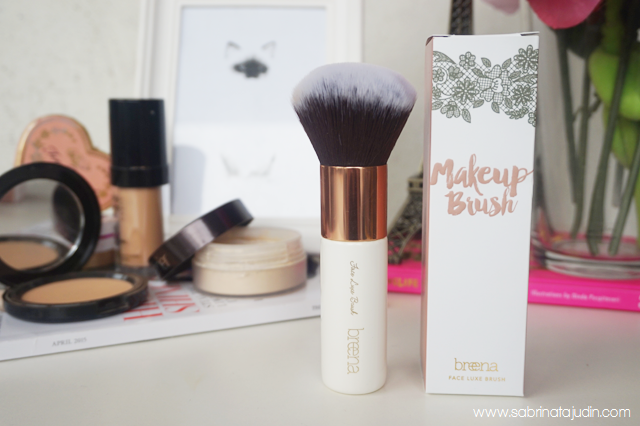 Gold engraved logo of Breena & the name of the brush are on the handle. So the name of the brush would last longer and wont rub away. Although it is white, the handle can be clean and wipe easily from dirt. The ferrule is made out of high quality rose gold metal. The bristles are actually has a white tip and dark brown on the lower part. In the picture it looks black, but it is actually dark brown. Each individual brush came with a box for that luxury feel to it. There is the brush description on the back of the box. I know it is my brush but I can't handle myself to let you know that this is one of the softest brush I ever own! It feels so luxurious when applied on my face. Not scratchy feeling and no streaky textured leave behind when you use this brush. Even after a few wash, the softness remains. Guarantee! It has a rounded dome shape on top so t acts like a sponge but does not absorb too much of your product and waste your product. Here are my favorite ways to use this brush. 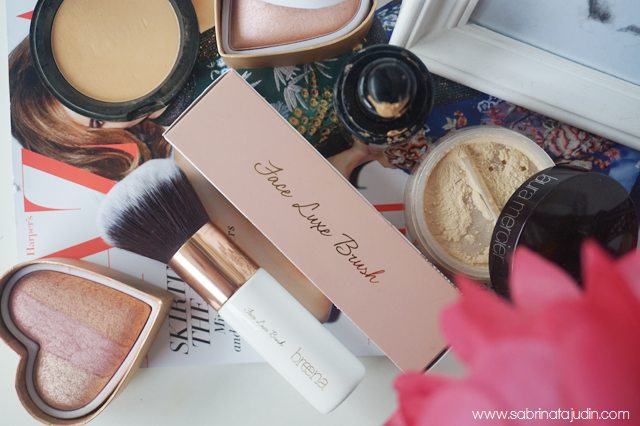 If you notice I have been mentioning about the best brush I use for my powder product. Yep, this is it! Been using it for years now since I got the sample from my factory and it is so hard to keep a secret! Haha! Glad it is reveal until it is fully ready to be launch. Since I got this brush, I never use face sponge to apply my powder. This has been helping me to evenly distribute my powder product effortlessly and evenly! The perfect amount of product is taken in just a gently swipe in any pressed product such as pressed face powder, foundation powder, bronzer, blush and many more. Other favorite to use this brush is for my loose type of product. Oh my oh my! Since I got this brush, I have been addicted to use my Laura Mercier Translucent powder with my brush. Its evenly distribute the powder to my face so easily. Does not swipe away my base which is the liquid foundation I applied before using my powder. Also if you search some beauty tips on how to apply powder, it is actually by "stamping" motions. With the Face Luxe Brush that is what you have to do. Your powder will last long and evenly buffed in to your skin and leaving your skin look natural and evenly covered. That is why I choose a short handle. Stamping and padding motion are easily done with this brush. No more sponge that full of bacteria! 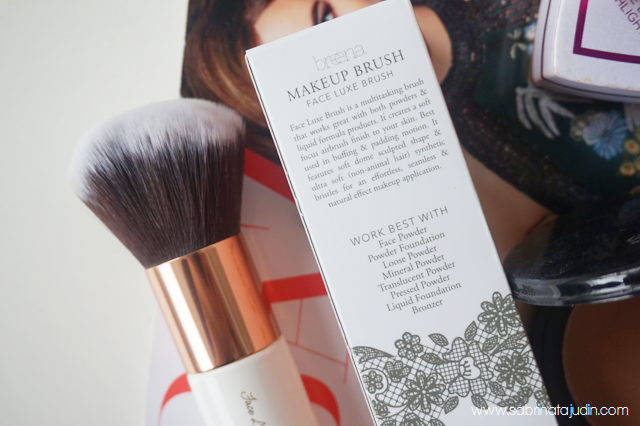 If you look closely, the brush head of this Face Luxe Brush has a domed shape. Looks similar to a round type of sponge. The bristles are densely packed but it is very flexible so getting around the corner of your face is not a problem. My favorite way to use this brush is for my face powder product and blurring out any harsh applied blush and bronzer all over my face. It also can be use for a very liquid-y type of product such as liquid foundation. If you love a semi-high coverage liquid foundation, you may use this brush. 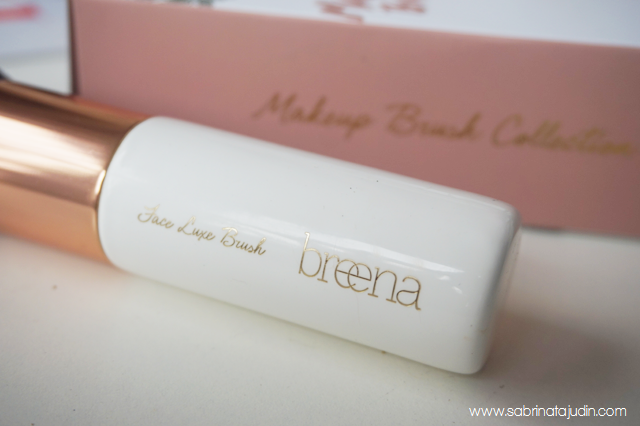 This brush is now available at www.breenabeauty.com for RM39.00 as an introduction price. As for now it is onky available to be shipped in Malaysia. I am still working on for my brand to ship internationally. Here it is, my #theprojectB, Breena Beauty. A vegan (no animal hair brush) and Muslim friendly makeup brush for you. What I am focusing are creating an affordable, essential and easy to use by all makeup lovers. Rather than piling up a few brush in one set and ending up only use a few of them, I wanted to create an individual brush for each steps in the makeup routine. Starting off with the basic one which is a powder brush. Maybe next one would be Foundation, then blush, then concealer. Who knows? So stay tune, and give me your support! I already working on the second brush. How to keep updated? Follow my Breena Beauty social media as below! Thank you so much for your support and I hope Breena Beauty will grow bigger with more awesome product coming in! OMG!! White and rose gold are my most fave colors! <33 Congrats babe, so so proud of you! and now i can't wait for mine to come!!! thank you! <3 hope you will love it! thank you Sab, for giving me yet another reason to love makeup application, esp with your new brush line ^_^ i always pray for your success!! Congrats Sab!!! Cantik sngt the brushes..looks so glamorous and fancy..dah setanding realtecnique...moga bertambah2 rezeki sab...nnti share2 la tips how to make it..
i hate it cause it's so cute!! by the way, congratulations..
in shaa Allah.. thank you dear! hi dear, good suggestion. that is why i took picture beside all of the product to give a scale ration on how big the brush is. hope it helps! <3 thank you so much dear! hehe its ok! thank you dear! I can't wait to get it and will review it too. I hope the quality is really 'up there' *making a raised bar of expectation with hands..hehe* Congratulations! haha thank you so much dear! in shaa Allah, hope you gonna love that brush! babe...congratulations! Breena Beauty is just as fab as u are! wishing u all d best...xxox! am getting one brush for myself definitely! awww..congrats on your own brand and product! may I know bila last introductory price tu Sab? Until when is the introductory price going to be available? Congratulations to you! BESTNYAA ada produk sendiri, I hope I can just be like you, this is so inspiringg. I wanna get this but it is soldout. When is the restock?